Can you play an instrument? It doesn't matter if you've only just started, been playing for years or are picking up your instrument after a few decades, we welcome you. No audition necessary, all you need is a desire to have fun learning to play along with others and be willing to perform in the community. Can't read music? We can teach you. Want to join us or find out more? Pop along to one of our practise sessions on a Monday between 2 & 4 pm. Visit our events page for dates & locations or send us a message using the contact us form. Alternatively call us or text 07856 425 697. First session is free, then subs are £5 per session or £2 for those on certain benefits. 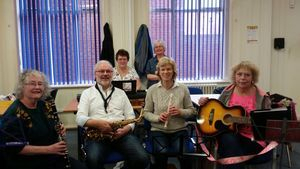 Help us to raise money for Mablethorpe Musicians. Use this site for your online purchases and we get cashback on what you've bought.